Italy is world-renowned for their delicious foods, decadent wines, and relaxed pace, and we want to share our lifestyle with you! Experience a wonderful week of riding on our beautiful horses exploring this majestic region. Explore the area up and down hills, woods and valleys framed by ancient castles, volcanoes and lakes. For those new to the saddle, our amazing instructors will have you feeling confident in no time in the arena! Let our castle will be your home. Just below the castle stands a handsome 18th century farmhouse, the original center of the estate’s farming activities. The farmhouse has been skillfully converted with careful attention to conserving authenticity together with comfort and privacy, in a pleasant combination with communal living. The large farm now contains eight charming cottages and 14 bedrooms furnished with original pieces. This immersion in the Italian culture would not be complete without wine tasting at a famous Italian vineyard and half a day of relaxation at a thermal pool. 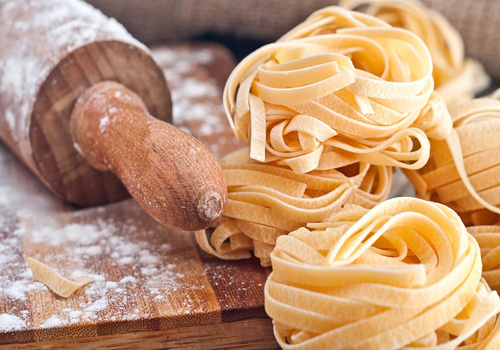 As an alternative, there is a lesson in cooking Italian cuisine that will allow you to reproduce our delicious food when at home. Best to rent a car! Transfers available from Fiumincino or Ciampino airports in Rome, or Orvieto train station between 10:00am to 6:00pm. Check-in to your room after 2:00pm. Usually from Saturday to Saturday but we are flexible when possible. Start with an afternoon arrival at the picturesque castle in Tuscany. You will be staying in the converted buildings in the castle grounds, taking breakfast each morning in the castle itself. After checking in, you will be served with a welcome drink and then receive a briefing from your guide/instructor who will be looking after you throughout the week. This morning you will be walking down to the stables which are located in the grounds of the castle. Here, the instructor will allocate you a horse and you will begin your riding. Novice riders may choose to take a lesson whilst more experienced riders will be enjoying an introductory hack around the castle grounds, an ideal opportunity to start to get to know the local area. Today you will be exploring this stunning area on horseback, visiting picturesque hamlets, passing through vineyards, olive groves, beautiful woods, and forests. Keep an eye out for wildlife – you may be lucky enough to see deer, wild boar with their piglets, foxes, and if you are lucky, porcupines! The horses and ponies are suitable for both experienced and less experienced riders, with experienced riders able to enjoy long canters alongside the fields of sunflowers, wheat, or maize. Today you will be riding towards the picturesque Lake Bolsena. This is a fabulous spot with breathtaking views of the area stretching from the impressive crater of Lake Bolsena on one side, to the hills surrounding Lake Mezzano on the other side. On a clear day you can see the sea 40 km away, shimmering like a mirror. As you head back to the castle along this ancient ‘outlaws highway’ you will pass through mature oak woodlands dotted with original farm dwellings built in the traditional tufo rock. Today is a rest day from riding and we have arranged for you to take a trip to the local hot water spa. Here you will find a natural hot water pool where you can relax and ease away any aches and pains. Treatments and massages may also be booked (extra charge). The owners offer a number of local excursions including a trip to an ancient Etruscan settlement in his 4 x 4 or an olive oil tasting visit. Alternatively, mountain biking is offered for the more energetic amongst us! Since the time of the Etruscans and the Romans, natural hot springs were considered a natural source of wellness with therapeutic properties. Given it’s volcanic soil, Southern Tuscany offers a vast range of thermal baths of different levels. Only 18 km away from the castle, next to the village of Sorano there is a well organized spa facility. There you can to swim in the warm waters and relax beneath two beautiful waterfalls. Here, you can enjoy a natural hydro massage, a special massage or various spa treatments in the wellness center. Waters are flowing from natural springs at 37° centigrade. The area around the swimming pool is largely equipped with sun beds and umbrellas to satisfy the needs of everyone. A small river surrounds the spa and receives the outgoing native waters. It’s mixed waters come from a little stream in the woods and several other hot springs. Today ride out along the famous Brigands Trail once more. This route was formally used by outlaws fleeing from the authorities and now offers a myriad of hacking opportunities along forest pathways and sandy tracks. Breath taking views of the local area will accompany our excursion all the way. Scattered throughout the countryside, archaeological sites with Etruscan tombs will serve to remind us of how ancient this beautiful land really is. Today we have arranged a wine tour. You will be taking a trip to the local vineyards and wine cellars where you can taste the wines (not to be missed!). If you want to ride this afternoon this can be arranged but will cost extra. The vineyards are located precisely on the slopes of the spur of tufaceous rock on which Sovana is perched, immersed in a breath-taking natural and archaeological panorama. The property was acquired by the Antinori family in 1995 and extends over 193 hectares (some 480 acres) on a gently sloping terrain of volcanic origin with a tufaceous sub-soil. It is situated at approximately 200 meters (660 feet) above sea level. The Fattoria Aldobrandesca wine premiered in summer 1998: Aleatico 1997. In 2004 premiered Vie Cave: the fruit of lands of widely varying features and careful zonal and oenological research. Sadly today it is time to bid farewell to your castle home and this spectacular region, but if you can’t bear to go home just yet we can organize an additional night or two for you in Rome. Horses: Mixture of local Thoroughbred and Warmblood crosses, with ponies available for children or small adults. This ride is suitable for beginners to intermediate-leveled riders. For those that have never been in the saddle before, we offer lessons in the sand ring to teach the fundamentals and grow rider confidence. Depending on how quickly you learn, there will be opportunities for some short trails. For intermediate riders, we will set you up with a suitable horse and take you on splendid trails. Excursions in the countryside on medium / long distances require rider’s ability to control the horse at the three gaits, including canter. Please note that helmets are mandatory. We have several helmets to borrow but recommend you bring your own for optimal fit. There are two outdoor arenas and lessons are available for all ages and levels in both dressage and jumping. 4 riding days with 1 full day ride (4-5 hours) and 3 half day rides (2 hours). For beginners: 10 hours riding divided in lessons/easy treks. Our horses have been carefully selected according to their attitude and breed to match our guests different levels. We have 20 horses at the moment that come from a wide range of breeds including: Italian Maremmano and Murgese, German, Dutch, French, Anglo Arab and cross breeds. They are our most important partners that we take a lot of pride in. Most of the year they live happily in the large paddocks, thanks to our reasonably mild weather and to the size of the castle estate. Constant training and experience for the horses are ongoing throughout the year. In general the climate in Tuscany is very mild. There are little differences between the regions, though. Rule of thumb: at the coast and in the valleys the summers are hotter than in the hilly areas, where the climate is very continental – rain falls are more often. Usually the summers in Tuscany are without rain and very hot, especially in the valleys. Spring (April and May) and autumn (October and November) might be rainy but there are still dry, sunny days and temperatures are pleasant. In the winter there are sunny, mild days but at night it sometimes gets very cold. All guests must wear a helmet. Helmets and body protectors of different sizes are available for our guests so that they can ride safely. Some boots of different sizes are provided but if you have your own boots and helmets it is advisable to bring your own. Note: Travel insurance is mandatory for this trip. Please make sure you purchase one with adequate coverage. Contact Hidden Trails for some options. - Normal riding gear or comfortable, yet sturdy pants. No leggings please. - Riding boots or shoes with flat soles that cover the ankles. - We recommend mini chaps. Old Traditions and Modern Hospitality! This fairytale castle is romantic with its castellated turret rising above age old woods. It has a long association with the powerful Prelates who played a key role in forming the Vatican State which culminated in Pope Pius IX's chief advisor, Cardinal Prospero Caterini, choosing the castello in 1848 as his personal residence. His descendants still use this as a country home. Just below the castle stands a handsome XVIII's farmhouse, the original center of the estate's farming activities. The farmhouse has been skillfully converted with careful attention to conserving authenticity together with comfort, and privacy in a pleasant combination with communal living, if wanted. 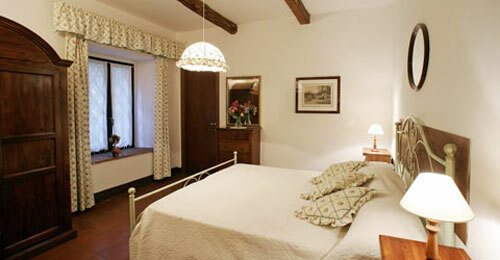 The very large fattoria, now contains 9 charming apartments and 14 bedrooms, mostly furnished with its original pieces. On the ground floor, opening onto the main terrace overlooking the swimming pool, there is a large "taverna" with brick vaulted ceilings. The space is divided into three main areas: meeting room, dining room, billiard room also with ping-pong table, plus a large kitchen available for all the guests and equipped for cooking courses as well. WIFI is available onsite. We also offer a washer and dryer to use for an additional cost. The outdoor pool is open from June 1st to September 30th. There is a tennis court on site where you can book in for 10€ per hour. Mountain bikes available for rent at 18€ per day / per person. Volleyball courts, mini football pitch, and Jacuzzi onsite. Massages are available onsite for booking. All meals are included in this trip from dinner on Day 1 to breakfast on the last day. We prepare local traditional food. All meals have a fixed menu. Continental Breakfast is served daily, from 8:00am till 10:00am at the old stable of the Castle. Lunches will be picnic or served at our Taverna, at 1:30pm. You will enjoy a fixed menu of appetizer+ first course+ fruit- a typical and good Italian menu! Dinner is served at our Taverna at 8:00pm. We provide a fixed menu of first course+ second course+ side dish+ dessert of typical Italian food, like lasagna, roll meats with ragu, cannelloni, etc. 1/4 of wine is served with lunch and dinner.